Yep, we love exploring concert movies that capture the essence of the live music experience. And we’re excited to share the news that LCD Soundsystem‘s Shut Up and Play the Hits will be arriving in theaters this summer. James Murphy and company wanted to go out in the spirit of the Last Waltz. 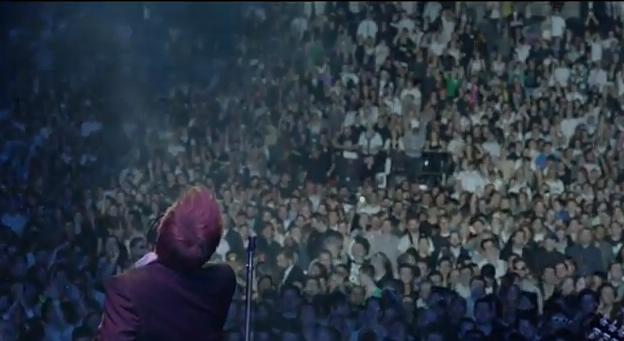 And by looks of the trailer, LCD Soundsystem was seeing their final show at Madison Square Garden as a celebratory funeral between them and their fans. That said, it’s interesting to consider this concert movie as a continuation of our exploration into how concert fans experience grief, loss and mourning during a live show. But in this situation things are a bit different. The loss is the ending of a band and not necessarily the loss of a life or a tragic event that happens at a show like the Sugarland tragedy. And this show isn’t like our 9/11 experiment where fans gathered at a concert to collectively and communally mourn after a shared national tragedy. And as they mention in the trailer, James Murphy and the band have complete control over the how their “funeral” goes, what songs get played and how longs it lasts. Those elements of control have me wondering a lot, because celebration, grieving and mourning are central elements to traditional wakes and funerals, and it’s extremely fascinating to re-think having more emotional control of those rituals in the context of the live music experience. Were You At the MSG show? What’s your favorite LCD Soundsystem live music love story? What do you think about a final concert being compared to a funeral? Share your concert experiences and thoughts in the comments below, on Twitter @livefixmedia, on Facebook , Google Plus, or call the concert fan hotline at 773-609-4341, and we’ll include them in a future episode of Live Fix Radio. For more information about the film before it’s release this summer visit www.shutupandplaythehits.com.